Da Capo Press, 9780306811616, 528pp. The Boston Globe hailed Privileged Son as "a well-researched, tough-minded, superbly composed story" by an author "adept at mixing scandal and gossip with art and business." It's the riveting tale of how a second-rate newspaper rose to greatness only to become a casualty of war-a civil war within the family that owned it. The story, never before told in such hard-edged style, spans the American Century, from 1884, when the Chandler family gained control of the just-born daily, through April 2000, when they sold it to the Tribune Company. 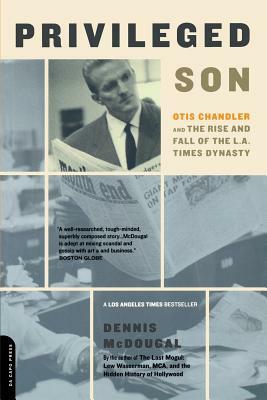 With a capriciousness that is seldom seen even in the most dysfunctional media dynasties, the Chandlers, who helped make the national careers of Richard Nixon, Ronald Reagan, and other major political figures, controlled Los Angeles and the Times Mirror Corporation-and Privileged Son captures it all. Dennis McDougal, an investigative reporter for the Los Angeles Times for more than a decade, has won scores of journalistic honors, including the National Headliners Award and several Associated Press awards. He lives in Long Beach, California.